Author Viet Thanh Nguyen won the Pulitzer Prize for Fiction for this book in 2016 and a litany of other awards. It’s been in my “to be read” stack for quite some time, though I held off for a while as it seemed a weighty book. Indeed, it was, but well worth it. 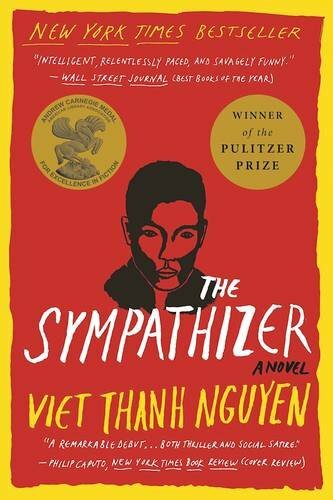 The Sympathizer successfully combines historical fiction, social commentary, and dark wit into a thoughtful narrative of post-Vietnam war. The Sympathizer’s narrator is a double agent - a man of “two minds”. He’s half-French, half-Vietnamese, an Army Captain in the Vietnamese Army, while spying for the Communists. As an attache to a high ranking Vietnamese General, he has access to top secret information, American intelligence, and a ticket to the United States after the fall of Saigon. Having spent his university years in the Unites States, he is able to more easily navigate the cultural differences than his fellow refugees, though racism is pervasive throughout - from his own countrymen as he, himself is mixed race, and from Americans’ distrust of the ‘yellow’ infiltration of the “Boat People”. Nguyen deftly portrays our protagonist’s two minds - sympathetic to both the southern vietnamese culture and to the communist cause; of an American mindset and longing for his homeland; of friend, lover, and confidant in the shadow of betrayal. Sometime brutally harsh with descriptions of torture, at other times with sardonic humor, The Sympathizer is a well-written philosophical look at racism, brutality in both war and “peace”, and survival.